Spotted boxfish larvae (Ostracion meleagris) were raised from wild-spawned eggs at 77-79F on wild copepods and artemia. The larval duration was 35 days. First record of Spotted boxfish culture. The spotted boxfish (Ostracion meleagris) is fairly common on Hawaiian reefs, where it primarily feeds on tunicates, sponges and algae. Males are attractive with dark blue black-spotted sides and a brown white-spotted dorsal back. This fish has a reputation for being difficult to keep in aquariums and will release ostracitoxin when stressed. Female adult Spotted Boxfish (Ostracion meleagris) on a reef in Hawaii. O. meleagris juveniles were reared many times for the Hawaii Larval Fish Project. O. meleagris eggs are slightly oval, contain a cluster of yellowish oil globules and measure about 1.5 mm in diameter. Hatching occurs after 3-4 days. The bulbous, dark pigmented larvae measure about 2.1 mm at hatching. O. meleagris larvae start feeding after about 4 days, undergo flexion between 10-15 dph and start juvenile transition by 30 dph. Live feeds during the larval phase consisted of copepods and newly hatched artemia. 40 dph O. meleagris juveniles readily feed on live artemia and frozen foods. O. meleagris larvae are easy to raise. Spotted Boxfish (Ostracion meleagris) larvae reared in the laboratory. 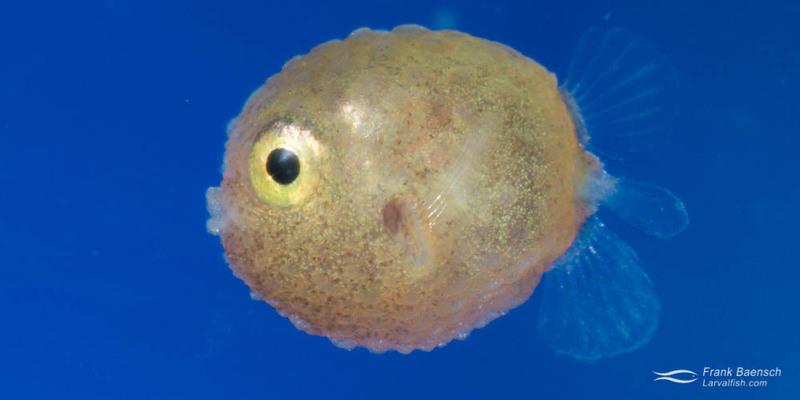 Interestingly, stressed or dead 90 dph O. meleagris boxfish juveniles do not release toxin. It appears that this species – like the cultured juvenile cowfish previously reported – does not develop the ostracitoxin-producing bacteria (Vibrio sp.) in captivity when raised from eggs. Captive breeding boxfishes and cowfishes without toxin is a big step toward making these unique fishes more suitable for aquariums.